In addition, SIGNiX's hosting provider holds global security certifications and compliance verifications for Service Organization Controls SOC 2 Type II and SOC 3. It isn't enough to meet the minimum requirements of the ESIGN Act and UETA. 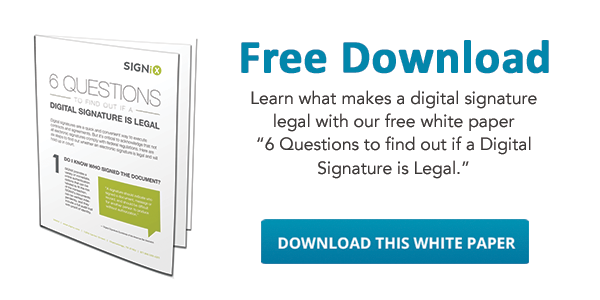 These laws simply say that an e-signature is a legal way to sign documents. What really matters is whether you're able to prove who signed your documents, when, how and what was signed, independently of the vendor. That's why we ensure the highest levels of enforceability—more than you'd get with a pen and paper. SIGNiX meets digital signature standards around the world. SIGNiX’s advanced digital signatures (what we call Independent E-Signatures™) are legal and enforceable in the European Union and around the world. SIGNiX offers a variety of ways to prove the identity of your signers. From a simple email or text message to more advanced methods, you can customize the identity authentication options for each of your signers every time a document is signed.